Our fans are amazing! We’ve just reached 55,000 likes on our BERNINA USA Facebook fan page, and that means it’s time for another giveaway! We quickly gained another 1,000 fans to hit 55,000 likes on our Facebook fan page—we love our fans! As a way to say “Thank You!” to all who join us at Facebook to share your love of sewing and creating with us, we are holding another special giveaway. If you are already a fan of BERNINA USA on Facebook, then you know that we’ve pledged to host a giveaway with a chance to win fun prizes like goody-bags, sewing books and even fabrics right here each and every time we gain another 1,000 likes through the end of 2013! Join in the fun by clicking over to our fan page, Like us, and be sure to keep your eyes open for our next giveaway. What is your favorite type of sewing; crafts, quilting, garments, or something completely different? Sweepstakes Rules: Open to residents of the 50 United States and the District of Columbia. One comment per fan. Comment must be submitted to the WeAllSew.com blog within 24 hours after blog post posting by August 9th, 12:00 midnight Central Time. Winner will be chosen randomly. Winner announcement one week after sweepstakes ends. My favorite is crafts like sewing handbags. I enjoy making quilts a lot. I also enjoy sewing fun things for my granddaughters. My favorite is to quilt. Oh I am the first to say that quilting has the number 1 spot in my life. quilting is my favorite – although i enjoy them all. I love sewing garments for children and home dec! I love to sew little girl clothes. This is good since I have a 4 year old granddaughter. I like to add a monogram, pockets, any thing to make it special. Right now, sewing is therapy for me. Garments! I love making things I can use!! I enjoy quilting the most but crafts are fun too! Thanks for the chance to win!! I have been sewing since I was ten years old- I started with garment construction and making my own school clothes. Now I mainly sew crafts and home dec items and for the last 15 years my greatest passion is quilting. Quilting and crafts are my favorites, but I also like home dec and clothing. Congratulations on such a tremendous milestone! Garments are definitely my favorite to sew, although I find most of my time is spent on clothing accessories, aka “crafts”, such as purses, scarves and such. I’d like to do more creative stitching with mixed media for solely artistic pieces at some point. My first choice of a sewing project is a garment, however, I enjoy making quilts too! I love sewing garments. Especially for my grand children! 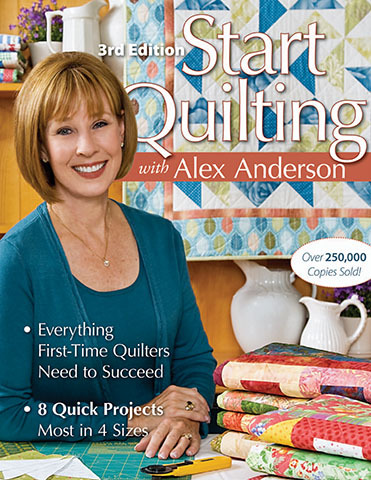 I just recently started quilting, so this book would really come in handy! Definitely quilting….well, maybe mending with a smidge of garment construction……then again there’s embroidery. I guess I love it all! Definitely quilting although I enjoy making little dresses for my granddaughter. I love quilting, but also enjoy making craft and clothing items for my family members! Quilting is my favorite followed by sewing fabric stuffed animals. I love sewing crafts, but I’m trying to learn quilting. My favorite type of sewing right now is appliqué quilting. I am currently working on a pillow that combines both, and having a lot of fun with it. I love my Bernina 1230, which is approximately 20 years old and works like new! Quilting from start to finish. But also making things for my grand babies. Also now making bias tape to be used on hospital gowns for very ill children. Makes my heart warm. Cute fabric for children’s hospital gowns is a terrific idea! Hats off to you! I love quilting it is truly my passion. Quilting, I do love to sew garments, but my new hobby is quilting. My newest favorite kind of sewing is sewing things that can be “upcycled.” For example, right now I’m working on making a purse out of a child’s dress that I bought at a yard sale for a dollar. I love to do small quilted projects, like totes, purses, wall hangings, and I also love to use my 730 for embroidery of all types. whatever I am doing. Clothes, now I get to add baby clothes, embroidery…is my latest experiment. crafts, I am an eclectic girl. Quilting is my first choice, then garments. My favorite part of sewing is making totes, purses, clutches, and just starting to add garments. I just started sewing in Oct 2012 and got my first Bernina 380 few weeks later. Quilting is my favorite type of sewing. I’m usually making cloth diaper covers, nursing covers or wet bags 🙂 On a baby kick right now. My favorite part of sewing is collecting the fabric! I know, I know, I’m supposed to actually sew it into something at some point, but the colors and textures draw me in … and before I know it, I have more fabric in my stash! I do love quilting, apparel sewing and fabric crafting. Love to quilt and sew handbags the most. I love to do embroidery applique and just finished an apron that was done in the hoop. Loved it! My favorite type is sewing small cosmetic bags and the like. I I like how quickly they can be made. My very close second -almost a tie- is quilting. I enjoy the whole process, and the satisfaction when such a large project is complete. My favorite type of sewing is quilting. I Love Quilting. I am working on a wedding quilt for one of our daughters now. And I love my Berninas I own four. I have to have a favorite? I love embellishing ready-made garments with Bernina embroidery, but have begun to watch the sewing webinars and now enjoy making garments, like the circle skirts, on which to embroider. I love to free motion quilt and decorative sewing with craft items and mixed media art. I love to make crafts especially little bags for your purse from novelty fabrics. Then I give them to clerks, nurses, teachers, etc. as a surprise. Love to see their smiles when they get something unexpected. Makes my life better, too. I am a quilting fanatic! Making clothing is my favorite type of sewing! When my girls were little I loved sewing fancy dresses for them, then as teens it was prom dresses. Now they are grown quilting has become my favorite followed by home decor. I love quilting!! I also love making clothing for my granddaughters. Embroidery is fun too! So many fun things to do with my Bernina : ) !! I love to sew, embroider, and serge. It is so easy to love sewing when you have a Bernina machine. All my errors have been of the human type and not the machines since I bought my Bernina. This is going to sound silly, but my favourite thing to make are dice bags. I make these lined bags which I sell as “dice bags,” but they’re just lined pouches with drawstrings. I’m part of a big RPG community. I love to make quilts and do home dec projects. Absolutely love free motion quilting and Bernina Designs for Embroidery. I love quilting! Patchwork is my favorite. I have started sewing clothes for grand babies. I just recently lost my precious mom. As we went thru her little apartment, I was shocked find all the little things that I had sewn for her over the last 30 years. Some, rather embarrassing to me now as my skills have grown, but they were precious to her. Her favorite piece was a wall hanging I embroidered a few years ago that had her favorite Hymn and complimentary embroidery designs. She treasured it and hung in the entry way of her home. Another was her little purple jacket that I embroidered with Red Hat Ladies designs. I can’t bring myself to wash it as it still smells like her. Maybe someday. For now I hold it close and think of all the fond memories of this amazing woman who taught me the love of sewing. My favorite is embroidery on Anything! Quilts, clothing, household goods….you name it! I love to make quilts and do home decorating projects. Quilting feels the most creative and appreciated, however…. I love creating garments to be worn & amazed at! I do machine embroidery on items I make. I do tote bags, purses, baby items (bibs, burp cloths, and baby quilts). Love your tutorials, I always find something new to try. I love making costumes and quilting is something that I’d like to pick up! I love making clutches and modern quilts! I really enjoy designing and making clothing and assistive items for people who have special needs. It gives me a great creative outlet, and makes something attractive and functional that adds life. I have taken up sewing about 3 years ago and luv it. My favorite type of sewing is definitely quilting! I use my machine for quilting and crafts. Some costuming for Halloween.. I sew Rodeo Queen clothes from dresses to shirts. I do some leather but most of the dresses I make are from gaberdine with embroidered or appliqued designs and lots of sparkle and rhinestones……It really is fun to see when the pieces are done and they are in the arena or on the fashion floor…. I like it all, sewing, quilting, home decor. Favorite is garment construction of fabric that has been embellished and or quilted. Love making quilts, but have been making bags, purses, totes, table runners and table toppers as well. I made a retro apron this year for mom, and oh boy, that was fun. (not) Quilting is a lot easier than making clothes, and besides, pattern makers don’t make nice clothes in my size. So a quilt is loved and used no matter what size. It truly is one size fits all. It’s easier for me to list my least favorite (alterations), because there are a number of things that I do obsessively, but kind of in rotation. Those would be costumes, heirloom, quilting and doll clothes. Love them all. I love providing custom embroidery on merchandise because it makes a unique product for someone that they can’t find anywhere else! Quilting – it’s my therapy! I love to quilt all fashions of quilts from miniatures to queen size. I love to sew gifts for others. Sometimes this is the oomph I need to start a project and complete it by a particular time. I have been sewing on a Bernina since I was 4 years old. I have 6 machines now and they specialize in different techniques. So it is hard for me to narrow it down to just one type of sewing. At this point and time in my life I am loving quilting. 10-15 years ago it was all about embroidery. Then throughout the year it changes depending on who I am sewing for. I am sure when the grandkids come along it will be clothes and toys as it was when my children were little. In a nutshell, I love all types even the ones that are taking me years to finish, the reason why is because I have tools – my Berninas. I have sewn on other ladies machines at church and just feel so blessed that my momma raised me on the best! I truly believe that I wouldn’t have developed as many sewing talents & projects if I was on any other machines. My next project is a christening outfit for my new grandson and a dress for his sister! Then, it’s on to quilts for my daughters! I love my Bernina! It’s such a joy to use! I like quilting best. Mostly the piecing. I haven’t gotten around to becoming proficient with my BSR yet but I will be practicing soon. definitely quilting , either piecing or applique. My favorite type of sewing is anything I design myself- the satisfaction of seeing a garment or a bag I’ve planned out without a pattern come together is beyond words. Even if it’s something simple, like the potholders I designed last night for my new apartment, sized specifically to fit my hands, I feel so accomplished when it’s finished and I can look at it and know that I have something that no one else in the world has. I love garment sewing, especially costumes. Quilting is my favorite craft and it’s also therapy! My current favorite is sewing fleece beanies and blankets. Machine embroidery, home dec and quilting on my fabulous Berninas! I have traditionally done more garments than anything else, but since I got my new Bernina 580E, a whole world of projects have found their way to my list…I have done my first quilt! Embroidery all kinds of fun things and have even worked on stuffed animals. I have also made my machine covers to coordinate in my sewing room. So I can’t really say that I am any one of those things… I’m looking for new projects every day! I have just gotten into quilting. Right now I am using my antique Singer sewing machine. While it is so much fun using the little workhorse and makes me think fondly of my Grandmother, Mother and all the love they put into the many garments and household items they sewed on it, I dream of one day soon owning and sewing on a Bernina! Thank you for the opportunity — I really hope I win!! Thank you for the opportunity to enter this contest. I enjoy sewing crafts. Doll Clothes 18″ Doll for my granddaughter. I enjoy quilting!! Piecing blocks to see how they all come together! I enjoy all of the above – just depends on whats needed or what I feel most like doing at the time. I love making tote bags! I have been sewing since I was 10 I started out making clothes for my self, then for others. I mad a few quilts. When I was 23 I copied my Grandmothers wedding dress, when my son was born I made most of his clothes. Then I got into decorating and crafts. Now at 52 I do mostly Quilting and purses etc. Definitely quilting, all kinds of quilting! I love making things for my home, which includes quilts! My aunt taught me to sew when I was 8 or 9 years old on an old vintage sewing machine. I made a pair of cotton shorts that I wore all summer. I haven’t stopped sewing since. My favorite sewing projects have been sewing for my two children (grown up now), and decorating my home. I would very much love to begin quilting, as it is would open up many creative projects. Crafts, mainly turning machine embroideries into pillows, wall hangings, table toppers. My favorite sewing is patchwork quilting! Just can’t get enough of it. Quilting is my first love but embroidery is a fast second. Love my Berninas for both of them. My favorite has to be quilting. Love being able to give a quilt knowing that they will have it for years. Also the while quilting process is a creative journey. I love embellishing my crazy quilts. Quilting is my favorite kind of sewing. I love to make quilts, pillowcases, and clothes for my grand kids. My favborite sewing is making fashion doll clothes for adult collectors – I strive for tiny perfect replicas of adult fashion. My favorite craft is quilting and my second favorite is crocheting. My favorite things to sew are Garments and Quilts…I also love to do Machine Embroidery.I have been sewing for about 60 years. I like making crafts- quick items that can be given as gifts. But a close second is quilting. I love the entire process of choosing a pattern, the fabrics, the sewing, and putting it all together. I love making handbags , wallets, totes, quilts and love embroidery….pillow cases…I guess I love it all…it really is very relaxing and my get away…Would love. To learn more how to..love to learn…at 67 I’m still learning and will never stop. Now that I’m retired I have plenty of time to do the things I like and sewing , quilting and embroidery are at the top of my list…thank you Bernina for making such a great machine. I bought it. A few years back and have loved it every day…..
Gosh, now that’s a hard question! I guess what I enjoy the most is sewing craft items such as quilts or tote bags!